As we age, our faces show the effects of gravity, sun exposure, and weight fluctuation. In addition, sagging skin, laxity of the deeper tissue in the face and neck, wrinkles, and extra fat can all make your face look older. For those concerned with these signs of aging, a facelift can be the ideal solution. Dr. Anna Wooten performs surgical tightening of the skin and muscles of the face and the neck, which dramatically improves one’s appearance, shedding years with a single procedure. Dr. Wooten performs many facelift procedures each year. She has helped men and women from Pittsburgh to Cranberry Township and beyond to look and feel their best with cosmetic surgery. Contact us online today or call 724-759-7777 to schedule your facelift consultation. 3 Why Get a Facelift? While there are a variety of cosmetic treatments that can tighten skin, smooth wrinkles, and add youthful contour to your face, nothing counters aging like a facelift. While other treatments may promote themselves as a convenient or non-invasive way to tighten your skin, once the skin has lost a certain degree of laxity, these procedures will have limited effectiveness. A facelift accomplishes skin tightening that will last far longer than what these non-invasive procedures can accomplish. A facelift is a procedure that is capable of tightening not only patient’s sagging skin, but also the muscles of the face itself. While a facelift is a surgical procedure, Dr. Wooten strategically places the incisions in the hairline, and are easily concealed when they heal. The way that you feel about your appearance can make a major difference in your everyday life. A facelift is a procedure that is capable of complete, long-lasting skin rejuvenation. In order to see your best results, it is important to find a board-certified, highly trained plastic surgeon who has a strong eye for detail and can deliver what is best for your natural appearance. When Dr. Anna Wooten performs a facelift, she not only tightens your wrinkles and eliminates your excess, sagging skin, she uses her well-trained hand and artful eye to return your face to its more youthful, balanced contour. When the excess skin has been removed and the underlying muscles have been tightened, a facelift turns back the clock on facial aging, and keeps the effects of time at bay for years to come! A facelift is an excellent way to both lift and tighten your facial skin, as well as to improve the contour and balance of your features. Thanks to her years of training and experience, Dr. Wooten consistently restores her patients’ faces to a healthy, youthful look. 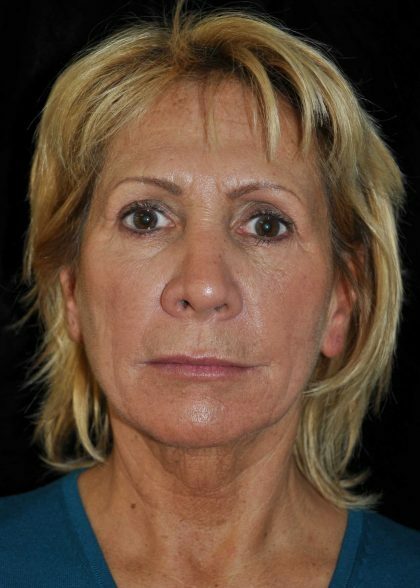 She understands that each patient’s face requires unique attention to achieve rejuvenation that is both noticeable and in-tune with the person’s natural face, and she adjusts her surgical plan accordingly. Smooth away wrinkles and fine lines that may have formed around your eyes and mouth. Eliminate your jowls and tighten and smooth your jawline. Restore the more youthful “V” shape to the face. Tighten facial muscles and restore a smoother jawline. Restore balance to your features. Achieve a more attractive contour of your facial structure. Restore a fuller, youthful appearance where volume was lost. Easily combined with other cosmetic procedures to achieve the patient’s ideal facial rejuvenation, i.e. 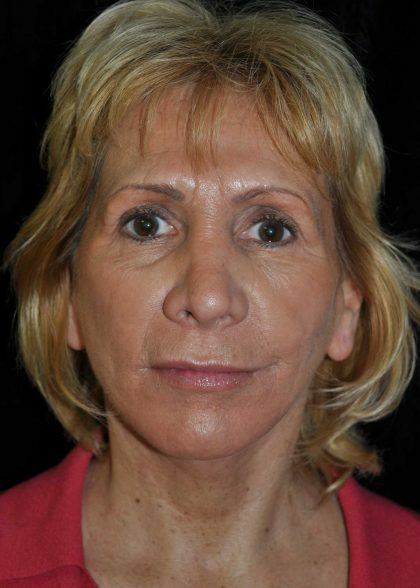 eye lift, chin implant, browlifts. Results last as long as fifteen years or more. Restore self-confidence. You will look like the energized, youthful person you feel like on the inside! Men and women who have would like to restore the youthful appearance of their face and are experiencing moderate to severe signs of aging in their skin are good candidates for a facelift. It is also important that candidates are non-smokers who lead a healthy lifestyle and are at a stable weight. Patients who have a pre-existing medical condition which could interfere with their healthy healing are advised to speak to Dr. Wooten about their best, safest skin rejuvenation options. 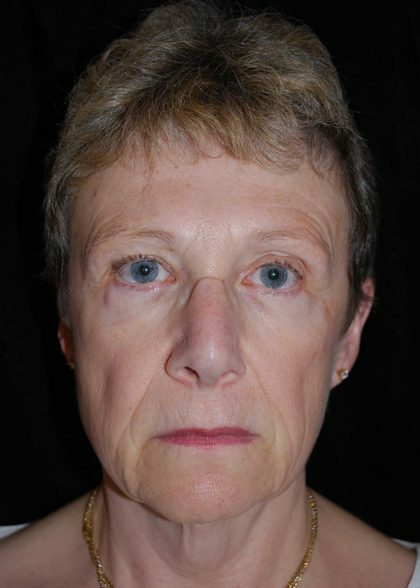 Patients often see their best results if they receive their facelift before age 60; some patients decide to undergo a facelift as early as their late thirties. Due to the fact that a facelift achieves best results in patients who still have a moderate amount of skin laxity. Patients are advised to consider consulting with their doctor about their rejuvenation options earlier rather than later. The time of life when a patient will benefit most from a facelift will depend on the condition of the patient’s skin and is best determined with the help of a board-certified plastic surgeon. Your facelift consultation with Dr. Wooten begins with a discussion about the specific areas of the face you would like to improve. Important points of discussion would be: recent weight loss or plans for weight loss and whether your facial features have aged at a consistent rate over time or if there have been accelerated changes. A thorough physical examination will be administered. This is followed by an evaluation of your facial anatomy. Your eyelids and brows are evaluated to see if a procedure, such as a blepharoplasty or a brow lift might serve as a good complement to your facelift. Dr. Wooten will then explain the results that a facelift surgery can accomplish in your specific situation. It is important that you leave the office with a clear understanding of what can and cannot be achieved with this procedure so that your expectations are accurate. While a facelift traditionally will tighten and smooth patient’s skin and tissue in their jaws, Dr. Wooten can also perform a neck lift during the procedure for patients who have excess tissue and sagging in their necks. A neck lift can correct a “turkey neck” by removing excess skin and tissue and tightening the underlying neck muscles. This can also effectively smooth the appearance of patients’ neck bands. 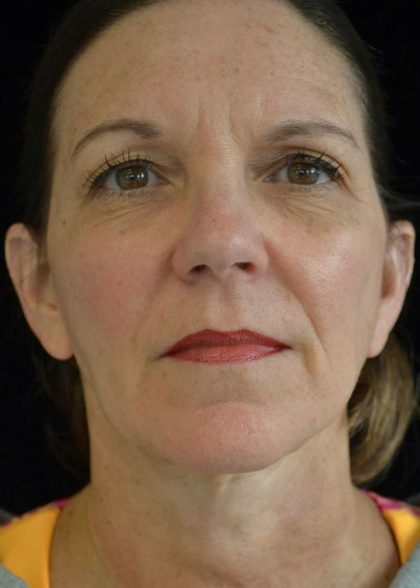 If patients have furrow or frown lines on their forehead or have a permanent scowl because of the low-lying position of their brows, a brow lift is a good addition to their facelift. 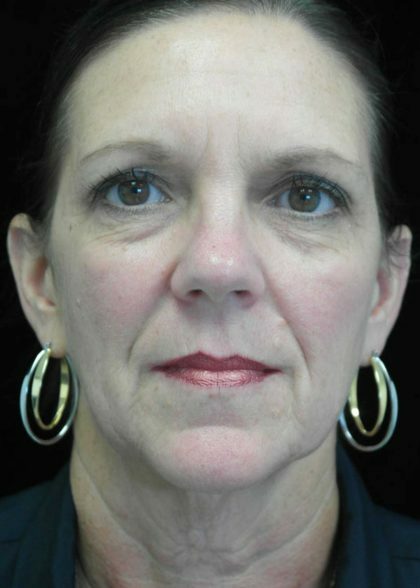 A brow lift will smooth these forehead wrinkles and give patients a more alert, revived appearance. Patients who have excess skin, tissue, or muscle that cause their eyelids to droop or their under-eye bags to look puffy and fatigued are good candidates for a blepharoplasty in addition to their facelift. Upper and lower eyelid surgery can be accomplished with a single incision in the upper eyelid crease, and another incision in the lash line of the lower lid. Even though scarring after a blepharoplasty is rare, patients should receive this procedure from a plastic surgeon who has a skilled, delicate hand, like Dr. Wooten, to achieve ideal results. One common effect of aging is a loss of volume in the midface area. Patients who would like to restore volume to their cheeks or other facial features can receive a facial fat transfer to enhance the results achieved during their facelift. The fat for transfer will be collected from another area of the patient’s body, processed, and carefully re-injected into the patient’s chosen facial feature to achieve ideal volume and contouring. Due to the fact that the volume is achieved with your own fat, the results are more likely to be accepted by your body. In fact, the result achieved with a facial fat transfer will likely last for years! Dermal fillers, like Juvederm and Restylane, are FDA-approved injectables that add natural-looking volume to a patient’s skin. Patients who are interested in learning more about how dermal fillers can augment their lips or cheeks to complete the rejuvenating results of their facelift are invited to call Beleza Plastic Surgery to schedule a complimentary consultation with our injectors. In order to perform a facelift, Dr. Wooten makes an incision from the base of the ear to the temples. Any scarring, which is rare, will be easily concealed in the hairline. Once the incisions have been made, Dr. Wooten will tighten the patient’s underlying facial muscles in order to achieve the most youthful, balanced contour for the patient. Any excess fat and tissue will be removed, and once the skin is placed into the desired, tight position against the patient’s facial structure, the loose, remaining skin will be removed. Care is taken to smooth the patient’s wrinkles and eliminate jowls, as well as create a stronger, firmer base that will better support patient’s skin in the future. The incisions will be closed with sutures. Patients who are experiencing the majority of their skin sagging and volume loss in the lower third of their face may be the best candidate for a mini facelift. To accomplish a mini facelift, incisions will be made at the base of the ear, but not into the hairline. The muscles of the lower third of the face will be tightened, excess skin and tissue will be removed, and skin will be laid in a tighter, more youthful position. This will target a patient’s jowls and create a smoother jawline. A full facelift will address wrinkling and skin laxity in the patient’s midface, while a mini facelift will not. Facelifts are performed under general anesthesia. Facelift procedures can take between three and four hours, or longer if the patient will be receiving a combination of procedures. In order to achieve their best recovery and results, patients who receive a facelift are advised to take two weeks off from work after their procedure. Patients will experience bruising and swelling that will last roughly ten to fourteen days. Dr. Wooten will discuss approved pain-relief medications with you. Patients will also wear a head bandage and may have drains for the first period of their recovery. Patients will return to Beleza Plastic Surgery after their procedure to have their stitches and/or drains removed, as well as to schedule check-ins throughout their recovery period. Detailed instructions will be given to every patient regarding their recovery, but we also encourage you to call Dr. Wooten’s office with any questions you may have. While many patients feel fatigued after their facelift, rest during this time is very important. Patients are also encouraged to take brief, intermittent walks to ensure ideal health and healing. When sleeping and resting, it is important to keep your head elevated above heart level. Avoid sun exposure whenever possible and use protection when you are going outdoors in any season. A month after your procedure, your incisions may still be pink. Do not be discouraged, as they are still healing. As the patient’s bruising and swelling improves, they will notice that their skin is tighter, their wrinkles are greatly reduced, and their jawline and facial contour are slimmer and more attractive. 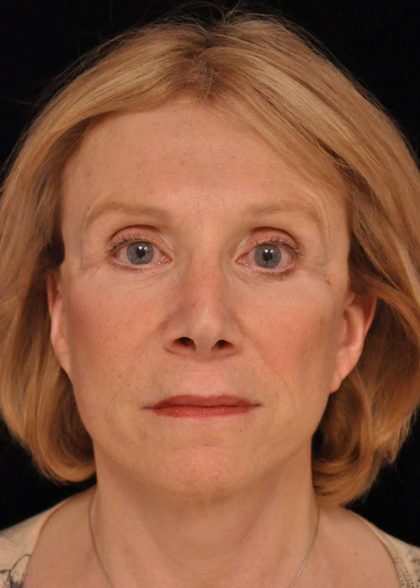 The results of a patient’s facelift will continue to improve for the next six to twelve months, as the tighter muscles and skin accept their new, more youthful position. Patients will be able to show off their rejuvenated appearance comfortably after one month. While the results of injectables and most skin tightening treatments will last for six months to two years at best, the results of a facelift will keep patients looking younger and revived for at least five to fifteen years, if not more. It will be like looking in the mirror at their past self! The price of a facelift procedure will depend on the type of facelift, as well as what if any additional cosmetic procedures the patient would like to undergo. After Dr. Wooten has assessed the condition of your skin and has a good understanding of your goals for your appearance, she will create an individualized treatment plan for you. Based on this plan, you will receive a breakdown of the anticipated cost of your facelift during your consultation.